About the Ad Preview and Diagnostic Tool. If you're going to try using image ads as part of your SEM campaigns, the steps to include image ads are very similar to text ads. 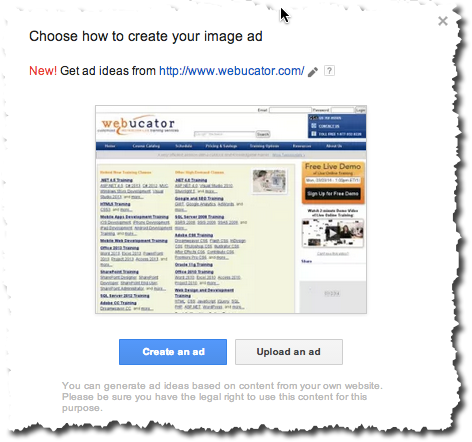 Please note: Image ads can only be displayed on Google's Content Network, so it's recommended that you have separate campaigns for your image ads for complete control. After setting up the appropriate campaign, you will need to simply choose New ad and then Image ad from the pull-down menu. A dialogue box will open, seen in the screnshot below. In Google's latest version, they've added a pretty interesting new feature. With the website you chose during your campaign setup, Google automatically crawls your website for design and content. Then, it produces suggested ads within minutes. 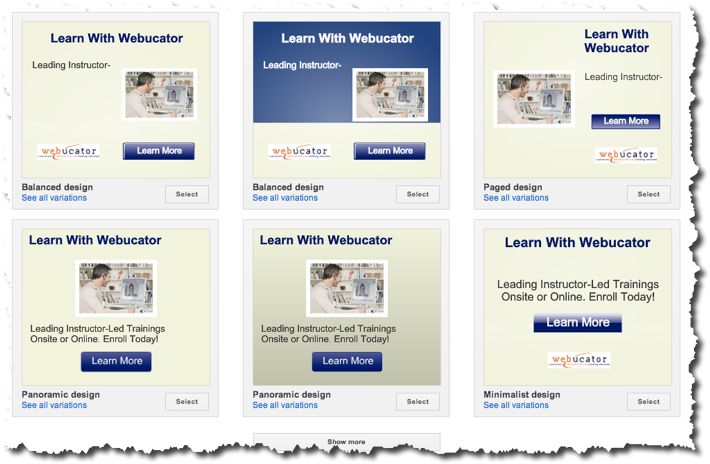 Below is a screenshot of a quick scan of www.webucator.com. You can then edit those ads right within the interface. The ad sizes avalable to you are listed on the bottom right, along with accepted file types. Once you have an ad ready to go, you can simply insert your ad and choose the appropriate display and destination URL's. Once you hit Save ad, as long as the file size is correct, give Google a day to approve your ad, and then you'll have the chance to go live. When you make the settings to your campaign that has these image ads, make sure you choose the appropriate Display Network match type under Networks. The first option, Show ads on pages that match the broadest targeting method, will show your image ads on any website that Google feels would be a good fit (based on your campaign keywords). And the second option, Show ads only on pages that match all selected targeting methods, will only show your ads on websites that you have handpicked. If you decided to handpick the websites you want to display your ads on, check out the Placement Tool, available in the Tools pull down menu. Here, you will be able to go through which sites might be best for your marketing campaigns. Select the campaign for which you want to control the ad delivery and then click the Settings tab. Under the Ad schedule section, click the + ADD SCHEDULE option. Click the values listed in the Time Period column and you will be allowed to configure your ad delivery (see the following screen shot). 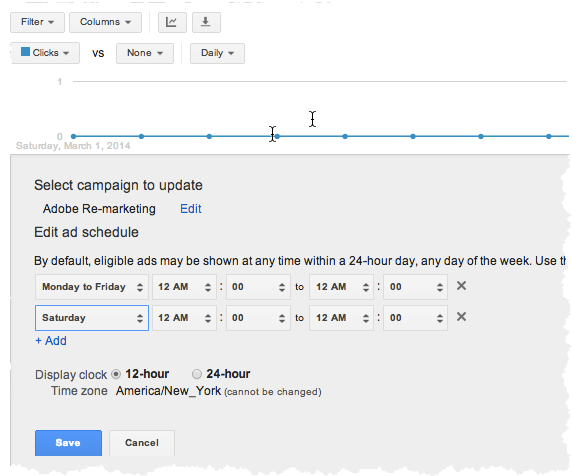 You can configure different ad schedules for weekdays and weekends. Click Save to incorporate these changes into your campaign settings. In the above screen shot, you can also see that times can be adjusted based on a 12-hour or 24-hour timeframe. Suppose you manage a small restaurant in mid-town Manhattan. In the morning, you run a campaign geared toward breakfast and during lunch time you run a campaign geared toward lunch. You would like to run the breakfast campaign only between 7AM till 11AM on weekdays and you would like to run the lunch campaign from 12:00PM to 4:00PM. Accomplish this setup using the Ad Scheduling feature in Google AdWords. Select the campaign (e.g., breakfast campaign) and then click the Settings tab. Navigate to the desired Campaign tab within your Google AdWords account. Navigate and select Settings and then click the Exclusions tool listed on the bottom of the page. Note: IP exclusion works on the campaign level only. Provide a list of IP addresses or use RegEx to provide a range of IP addresses to filter. Click Exclude IP Addresses to conclude the process. You have noticed "click fraud" on your AdWords account which is costing you money. Through some investigation you were able to find a list of IP addresses responsible for this click fraud. 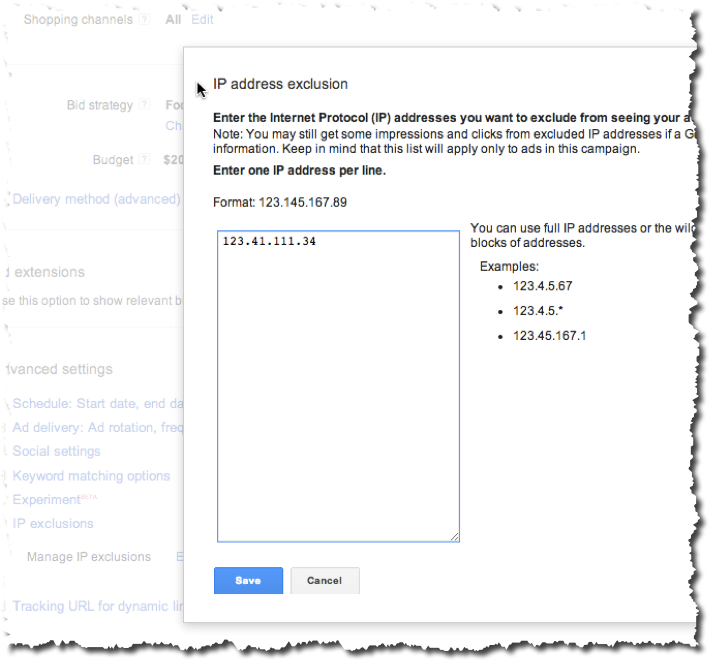 Filter these IP addresses from your AdWords account. You can only filter IP address on a campaign level. Go into each campaign that you would like to exlcude IP addresses for, and remove them following these steps. Naviaget and select Settings and then click the Exclusions tool listed on the bottom of the page. Navigate to the Tools tab within your Google AdWords account. 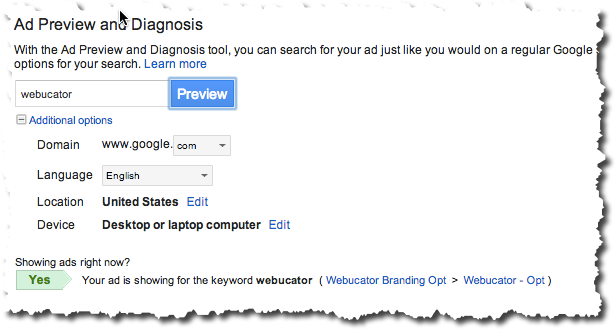 Using the drop-down menu, click the Ad Preview and Diagnosis tool. In the keyword field, enter the search query for which you want to test your ad. In the Google Domain field, select the Google property on which you are running a particular campaign (e.g., Google.com or Google.ca). Under the Country field, provide your geo location preference by selecting a particular country name and by providing a particular region (states) in which you are advertising. In the above screen shot, you can see that Google is providing us with insight into which campaign and which ad group within that campaign was responsible for generating this ad. The pseudo SERP shows exactly where your ad would have shown on Google's property. When your ad provides the best result for a search query (this is determined by Google). For top-ranked ads with high-quality scores. Ad Sitelinks are campaign specific, so first navigate to a specific campaign in your AdWords account. 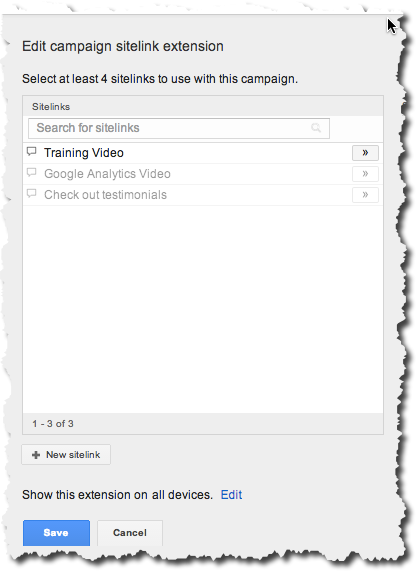 Use the drop-down menu that says View: Sitelinks Extensions. Enter up to 10 additional links that you want online searchers to see along with your ad. Click Save to incorporate these changes.